A new mobile payments startup is entering the market. Clover is exiting from stealth today as a fast, simple mobile payments technology that aims to allow consumers to checkout from a mobile site or app in under five seconds with one-tap. The company is also announcing that it has raised $5.8 million from Andreessen Horowitz and Sutter Hill Ventures. Today, Clover is releasing an SDK for Android, iPhone and the iPad that will allow developers to integrate Clover into their apps. Here’s how it works. 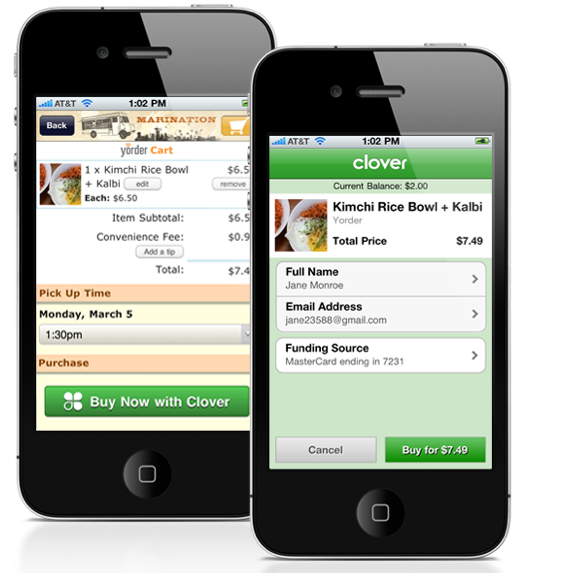 In order to use Clover, consumers have to have the Clover app downloaded to their phone. When signing up they share credit card details, their mobile phone number and other billing information and then they are ready for one-click payments using the platform. On the developer side, Clover says that it has minimized network round-trips to increase the chance of successful transactions on spotty mobile networks. There’s also simple SMS-based initial authentication that is used to lock Clover accounts to a phone number and the platform employs two-factor authentication by default, using mutually authenticated SSL and a PIN. The startup says that because there’s no username and password, and because they lock accounts to phone numbers, the threat of account takeovers, which is a common problem with online payment services, is largely averted. For a developer who has integrated Clover, the payments experience will simply include a “pay with Clover” interface to checkout, and the SDK will detect those who have Clover installed. For existing Clover users, they can simply enter their phone number and or a separate mobile PIN for authentication and complete the checkout experience in under five seconds. For those who do not have a Clover account, they will be prompted to download the app and sign up for the service. To encourage the user to download the Clover app (and to compensate the developer for helping the platform build the network), Clover will offer an instant refund of up to $5 on the consumer’s credit card transaction when they install Clover. And to help incentivize developers to start using Clover, the startup is announcing a $100,000 developer fund. Clover charges a 3% per transaction fee. Early adopters include Lolapps, Coupon Trade and Yorder. When asked about the competition from PayPal, which also offers a one-click mobile payments option, Lamkin explains that Clover has been specially designed for developers who are feeling the conversion pain on mobile payments. “The design has been built around speed and security, with the native app as a gateway,” he explains. It’s definitely ambitious for Clover to take on the likes of PayPal, Google and others when it comes to mobile payments. But the company is on to something by identifying a huge problem in the mobile payments industry-simplicity and ease of use. It appears that the startup or company that can provide a fast mobile checkout experience (while also promising security and incorporating consumer behavior) will be the true winner on online mobile payments.